I had the opportunity to step out of my shell today. I'm not an introvert by any means. Lord knows I love people and I love to run my mouth. I'm always out and about and I set up shop at so many conventions. I meet and draw hundreds of smiling faces every year while caricaturing at Disney. But cosplay? Not really my thing. Honestly I think there are so many others who do it way better than I can. I respect the time and effort fans of the genres put into bringing their favorite characters to life. I can barely sew a button badly onto a pair of pants. But there is this little fella who is sick. A very young child named Armani. A horrid cancer has set up shop in his brain, and he's bravely fighting an uphill battle with it. Treatments aren't cheap, and bills are mounting up. So our good friends at World of Comics decided to hold a fundraiser to help ease the financial burdens that Armani and his family are facing. And they managed to do it while bringing a smile to his face. Like most little boys his age, he digs superheroes. What better a way to show that he isn't facing his villain alone, than to bring cosplay warriors to his side. I could've easily drawn a piece for a raffle, done caricatures or simply made a donation on this day. But something in my head told me I should join his team of champions. Thanks to my good friend and (awesome cosplayer in his own right) Xavier, I was able to temporarily become someone else. Someone larger than life, and eager to smash some bad dudes. 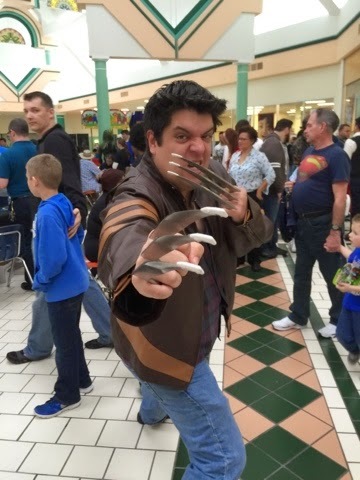 Today, I was the Wolverine. My costume wasn't the most extravagant. Hell, I blended in more with the crowds than I did the cosplayers. But I got to be a part of something bigger. I was able to see the interactions, the wonder and the moments where this strong young soul got to become an honorary member of the Green Lantern Corps. He was able to run around with Spider Man, and be flirted with by Supergirl and Black Cat. Today Armani got to just be a kid. He got to escape the monster for a while, and play. Seeing him surrounded by so much love, and so much spandex, was a testament to the good that the cosplay community does. So thank you cosplayers. Thank you secret superheroes for everything that you helped bring this mini hero. Both emotionally and financially. And thanks for letting this silly pusher of pencils and ink join you for a day in your crusades. I kinda liked being a super hero today BUB!